Plymouth came for a point, QPR weren't up for it, what do you get? 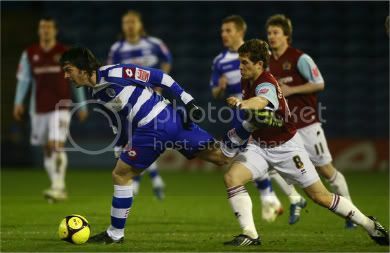 One of the worst games ever seen at Loftus Road. My apologies for the lateness of this report, but myself and the gang attended the QPR Player of the Year Dinner Dance at the Radisson Edwardian Hotel - more on that very shortly. But onto the game and you would really think that with everything that has gone on this season, the players would at least have put on a performance for the last home game of the season or better still, look half interested in doing so? QPR: Cerny, Stewart, Mahon, Leigertwood, Routledge, Agyemang (German 66), Gorkss, Connolly, Cook (Balanta 56), Miller (Ramage 62), Helguson. Subs: Delaney, Hall. There really isn't anymore I could add about the game so basically, I won't. But sadly, the players took their, what seemed to be, a couldn't give a toss attitude to the Player of the Year Dinner and Dance. After a welcoming speech from Amit Bhatia, the awards started and brought more disappointment. I can appreciate that many people would be terrified at the thought of public speaking, but for Damion Stewart, Kaspars Gorkss and Matthew Connolly, to not even say a 'THANK YOU' to the supporters that had voted for them, was a pretty poor show. As mentioned, myself and the gang didn't let this spoil our evening, but there was plenty there that were extremely disappointed and angry with the attitude of the players and indeed, QPR in general. This was a chance at the very least for the players to give a little something back to the fans. They chose not to do so and it is becoming increasingly difficult to continue to support this club who in return, quite obviously, just don't care about the supporters any more. To end on a positive, Gareth Ainsworth is an exception to the above and he epitomises what this Club used to be all about. Myself and some of the gang are privelaged to know Gaz personally and after catching a chat with him last night, he himself was keen to get away and back to his family and no more so, for his new three week old baby daughter. But in trying to do so, he never once refused an photo, autograph and chat with any supporter that approached him and he finally left at just after midnight. A absolute credit to Queens Park Rangers!! 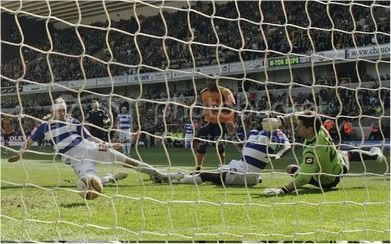 QPR failed to put the promotion party on hold, as a goal from Sylvan Ebanks-Blake fired Wolves back into the Premier League. Myself, PK and Special Guest for the day from White Hart Lane, Glenn, set off at around half past ten for a breeze of a journey and arrived at Molinuex just before 12.30. Due to the pubs around the ground recommended to be generally avoided, we took a pre match in the local Asda and a few cans in the car park, before going in to join the party. Unfortunately, there didn't seem to be any jitters from Wolves who settled quickly and had much the better of the first half, but Rangers were dealing well with what ever was thrown at them and the sides went in level at half time. But just seconds into the second half, the home crowd erupted as Damion Stewart tried to usher the ball out of play, but was caught out by Andy Keogh. who squared into the path of Ebanks-Blake who had the simple task of side-footing the ball home from just six yards. The R's continued to battle on and had two great chances of their own. After Rowan Vine saw his deflected effort strike the bar, the best chance fell to Helguson, who, went put clean through from Gavin Mahon, fired straight at Hennesey in the Wolves goal. 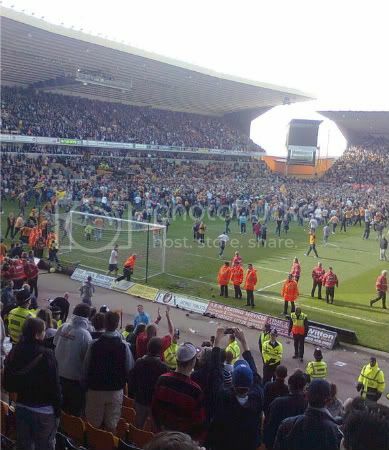 Wolves then obvuously decided to shut up shop when Marlon Harewood replaced Ebanks-Blake and despite the calls from the PA Announcer to keep the pitch clear, thousands of Wolves fans charged on at the final whistle to celebrate and begin the party. QPR: Cerny, Stewart, Mahon, Routledge, Vine (Taarabt 63), Gorkss, Ramage, Connolly, Cook (Ephraim 63), Lòpez (Leigertwood 85), Helguson. Subs: Delaney, Miller. Lofty's Man of the Match - Matt Connolly, an outstanding performance at the back for the R's. In summary, Rangers were always going to be on a bit of a hiding to nothing, as having little but pride to play for against a Wolves side driving for promotion and the Championship. But Ainsworth`s QPR side were certainly not disgraced. The result I suppose was a fair reflection, but it could have been very different had Rangers taken some very good chances. With the celebrations going on inside the Stadium, it meant a reasonably quick getaway and home at a much more reasonable hour to that of Burnley last week. Finally, I would like to congratulate Wolves and their fans on a great season and GOOD LUCK next year in the Premier League!! On Saturday QPR travel on their penultimate away fixture of the season to promotion chasing Wolves. If Wolves pick up the 3 points from this game then they will be automatically promoted and possibly crowned champions, provided results go in their favour. Can Rangers become party poopers??? Current Capacity at Molineux - 28,500. Molineux is a fantastic football ground to visit, despite not having many happy memories in my past four visits there, we've lost all four games! It is a very unique arena and has a lot of character about the place. The ground is built in an oval shape and a good atmosphere can be generated within the confines of the ground, despite having a fairly large space in the corners of the stands. 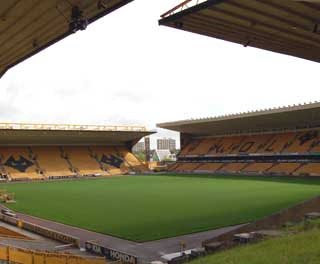 Molineux has been the home for Wolves since 1889. It has been completely redeveloped over the years. The Steve Bull stand, which is where the away fans are usually in attendance, was the first to have a make over in 1979 and despite the work being carried out so many years ago it was a stand built way ahead of its time and is still looking very fresh in comparison to the other three stands surrounding it. In the early 1990's the Stan Cullis, Billy Wright and Jack Harris stands were all rebuilt, with the Jack Harris stand being the final one to be finished in 1993. There are plans afoot to expand the capacity at Molineux to 40-45,000. This would include knocking down the Stan Cullis stand to increase the seating there as well as filling in the two corners between the Stan Cullis stand and the two on each side of it, the Billy Wright stand and Steve Bull stand. A quick reminder to Rangers fans, we are no longer in the Steve Bull stand for this fixture.We are now in the Jack Harris stand, so proceed to entry 5 when you wish to enter the stadium. There is unreserved seating so take your place early to get the best possible view for yourselves. Also as you enter the turnstiles you will receive a refund on your ticket as tickets in the Jack Harris are a lot cheaper. In recent years this has not been a happy hunting ground for the R's. The last victory came at the end of September in the 98/99 season. Rangers ran out 2-1 winners on the day. Six more visits have passed since then, Wolves have won 4 and drawn 2. Last year has the closest Rangers have come to ending that sequence, a fantastically entertaining encounter which ended 3-3. Wolves grabbed a dramatic 97th minute equalizer through Andy Keogh (I think) in the 5 minutes of stoppage time that was allocated. There are 2ways of getting to Molineux so I shall try my best to describe both ways. Turn off the M6 at junction 10 and bear left onto the A454. Head towards the City Centre/University and you will hit clear signage for Molineux as you near your final destination. Jump onto the M42 heading towards the M5. On the M5 turn off at junction 2. You will encounter a number of roundabouts but head towards Wolverhampton/University North. You will jump onto the ring road this way which will lead you up towards the ground, which will be clearly signposted as u near the stadium. By Train:- The train station is located is the middle of the city centre. As you walk out of the station proceed to walk towards the town centre. At this point you will come across the inner ring road and turn right. Follow the ring road around as is goes to the left in a circular fashion. You will then see Molineux on your right hand side as you approach the ground. It is strongly advised to not enter any pub within touching distance of the ground as the Wolves fanatics dominate these areas. If you fancy a pre match beverage then you have two options. Either try one of the pubs in the city centre, it is advised to keep colours to a minium here. Alternatively you can enjoy a drink in the ground, which is a lot more hassle free, unless you are not a fan of queuing, especially at half time. There is a large array of burger vans around the stadia for you to enjoy. If you feel like tasting the delights inside the ground then here is a small piece of info that may help. Hot dogs/burgers are £2.20 as well as all the pies being £2.20. I have never ventured into the town but i'm sure it will be easy to find a difference range of food available. 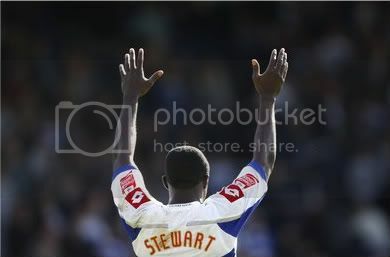 A Damion Stewart header in the 88th minute completed a remarkable comeback for QPR from being 2-0 down to win all three points, in what was a very entertaining afternoon at Loftus Road. Before the game, there was a minutes applause in honour of QPR League Cup Winning Captain, Mike Keen, who sadly died at the weekend following a short illness. He was 69. Keen made 393 appearances for the R's, scoring 39 goals - RIP Mike. Before the game, there had been rumours of protests against Flavio Briatore, which didn't happen, except for a few half hearted chants from certain sections of the ground. But again, it was a distinctively muted atmosphere around the ground before the kick off which remained until kick off time. The blue and white bar was half empty at half past two and the lady in one of the food kiosks in the Lower Loft, was reading her book. But gladly, Gareth Ainsworth's QPR side certainly lifted the spirits as the R's went on to produce an excellent performance in what was a thoroughly enoyable game of football. In fact, why we ever had to comeback from 2 goals down is anyones guess?? Rangers literally peppered the Wednesday goal in the first half, had two goals disallowed and hit the post twice, before the Owls took the lead on 35 minutes - as Etienne Esajas's inswinging courner was headed into his own goal by QPR skipper Gavin Mahon. It got worse after the break and at the start of the second half, Stewart tangled with Clarke in the box and referee Darren Deadman had no hesitation in pointing to the penalty spot and Tudgay slotted home the resulting spot kick. Rowan Vine entered the field on 56 minutes and just 6 minutes later, had reduced the deficit - Routledge's shot across goal could only be parried by Grant into the path of Vine, who tapped the ball home from two yards. Ten minutes later, it was all square with Gavin Mahon bringing the scores level with a stooping header from a Cook cross at the far post. The comeback was complete with 2 minutes to go, when the excellent Cook, delivered another fine cross to the far post for Damion Stewart to head home powerfully from close range. QPR: Cerny, Stewart, Mahon (Leigertwood 76), Routledge, Gorkss, Ramage, Connolly, Cook, López (Ephraim 68), Helguson, Taarabt (Vine 56). Subs: Delaney, Miller. In summary, there has been so much negativity around the club over the past week and I myself, must admit to being extremely lethargic about attending today's game and on more than one occasion, had thoughts of giving it a miss. 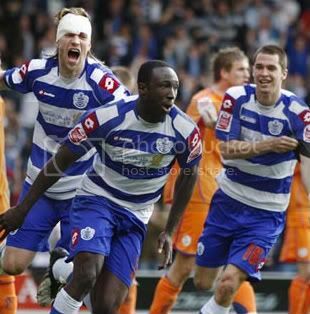 But I am so glad I didn't as I saw a memorable game of football, a memorable comeback and a great performance from QPR!! Even more memorable for the memory of Mike Keen, with the R's coming back from 2-0 down to win 3-2, as per that day in 1967!! QPR ended what was a traumatic week for the Club, with a narrow defeat away at play off chasing Burnley at a sunny Turf Moor. For one reason or another, it was a slightly late get away for myself, PK and Leeroy but we arrived in what was a very sunny Burnley at just after 2pm. As per usual for Burnley away, we used the excellent Cricket Club to park, but due to our later than normal arrival, we used the club for a post match beer rather than a pre match one and spoke with a few Clarets fans, who were as bemused at what was going on at QPR, as we were. But what was noticeable around Turf Moor amongst the QPR supporters, was how subdued it was and I have never been in an away end yet that was so quiet, but understandably so after the events of the week gone by and indeed, the season as a whole. Moving onto the game which overall, was pretty forgettable. Burnley seemed nervous, Rangers looked lost and in all honesty, how could you blame them?? The contest was decided on 49 minutes as Burnley upped the tempo in as soon as the second half started - Carlisle towered to meet Blake's right-wing corner with a powerful header, which was clearly deflected into the net by the arm of Chris Eagles. Personally, I am always one who looks at player reactions in these incidents - Eagles looked at the linesman, and R's keeper Radek Cerny ran 40 odd yards to protest the decision, but in all that, the goal stood. Rangers had a great chance to equalise late on, when Cook, albeit unexpectedly, met a powerful cross from the left and drilled the ball wide, but in truth, one goal would have always been enough for the home side today. QPR: Cerny, Delaney, Leigertwood, Routledge, Vine (Alberti 85), Gorkss, Ramage, Connolly, Di Carmine (Cook 54), Ephraim (Lopez 72), Taarabt. Subs: Stewart, Mahon. In summary, Burnley deserved their win but despite the disappointment, one thing you couldn't blame Rangers for, was a lack of effort, which you would fully expect from a side led by Gareth Ainsworth. As mentioned, they looked lost at times and again, showed very little up front. Ironic really that QPR's top scorer, Dexter Blackstock, scored the all important winner for Nottingham Forest against Bristol City yesterday. Note: For those who used to follow the pie rating, the Chicken Balti tasted yesterday at half time, was the best in the Championship - 10/10 without a shadow!! 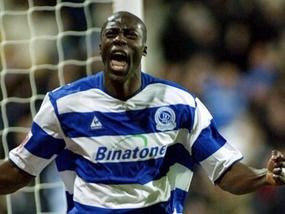 And finally, warmest Congratulations go to QPR Legend, Paul Furlong, who scored his 200th career goal, with a superb header in Barnet's 1-0 win over Bournemouth yesterday!! Queens Park Rangers Football Club has today (Thursday) had to terminate Paulo De Sousa's employment with the Club with immediate effect. It came to the Club's attention that Mr De Sousa had, without authority, divulged highly confidential and sensitive information. The Club, with legal advice, responded in this way to protect its position. Player / Coach Gareth Ainsworth will take Caretaker charge on a temporary basis, from now until the end of the season. 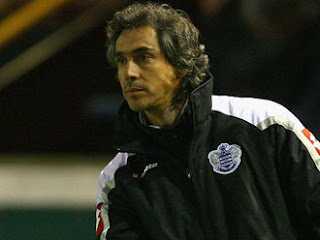 After just 26 matches in charge, Sousa by all accounts had annoyed the QPR board for telling members of the press after the Palace match that he had no knowledge of the deal to take Dexter Blackstock to Nottingham Forest until after it had been agreed. It is also believed that the sacking relates to a post on the on a message board earlier this week - from a supporter who spoke to Sousa after the Crystal Palace match on Saturday with regards to a number of details about the fitness or otherwise of first team squad members and criticised the ability of others. This post was not removed by the site and its content got back to the club, that ultimately has led to Paulo Sousa being fired. I cannot believe that once again, I am sitting here writing about the sacking of yet another, QPR Manager. I am gobmacked!! With the Season Ticket Early Bird deadline looming, we are now going to be buying, if at all, with no idea who the new boss will be for next season, or the first 10 games of the season?? In truth, who on earth is going to want this job??? Flavio Briatore - CONGRATULATIONS!!! - you have successfully turned our QPR into a complete and utter joke!!! 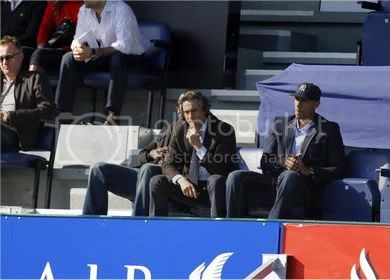 Paulo Sousa has told Sky Sports News that he completely denies all allegations against him. With not much more to say politely on the subject, I would like to wish Paulo Sousa all the best for the future... and for the second time this season, wish Gareth Ainsworth all the luck in the world for what you have taken on!! Your going to need it, my friend!! A whole month has passed us by without an away fixture to look forward to, and now we have two to look forward to in consecutive weekends - we start with this weekends trip to high flying Burnley. Burnley have had Turf Moor as their home since 1883, which is the longest continual occupation in a ground by any club in the entire Football League. It is very much a ground in development, with two sides redeveloped in the 1990's and two older stands. These two stands have been given the go ahead to be renovated, with the planned completion to be before the start of the 2010/2011 season. Away fans are housed in the David Fishwick Stand, which holds 4,125. The stand itself is very dated indeed! There are no plastic seats which are traditional to the average football groud now. In their place is the old fashioned wooden seats from the 1960's, some of which are missing in action. There are two supporting pillars which can restrict viewing slightly but overall its not too bad, there are much worse out there. This is an away trip that Rangers fans never look forward to. Our record at Turf Moor is so poor that you could effectively surrender the 3 points even before you leave your front door. Rangers 1st ever win at Turf Moor came on 8th March 1980. It was the 8th attempt of gaining victory and ran out comfortable 3-0 winners in the Division 2 fixture. We then had to wait another 27 years to taste victory again. This time in came in the rearranged fixture, due to the untimely death of Ray Jones, on a cold Tuesday December night. 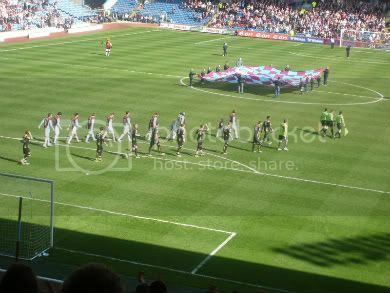 In a very tight contest Rangers managed to overcome the Clarets. An early 2nd half header by Damion Stewart and a fine run of over half the length of the pitch and walking the ball into an empty net by Rowan Vine right at the end proved to be enough to survive the late Burnley onslaught. For those of you that dont have a sat nav then i would suggest the following. Leave the M6 at junction 29 and merge onto the M65. Leave the M65 at junction 10, follow signs for Towneley Hall. This will lead you, eventually, to the ground. By Train:- There are two train stations in Burnley, Burnley Central and Burnley Manchester Road. From Burnley, Manchester Road you will endure a 15minute walk. From the station head down Centenary Way. Walk down the dual carriageway which leads downhill towards the ground which you should see in the distance. U will then hit a roundabout, take a right which will take you underneath the canal bridge. Carry straight on and you will reach your destination. From From Burnley Central you will have a slightly longer walk of around 20mins. As you walk out of the station head for the retail park in front of you. This will lead you onto the inner ring road, take a left and walk for around 300yards and you will reach a set of traffic lights. Take a right turn and keep walking until you reach a big roundabout. At this point take a left and this will lead you under canal bridge and keep heading straight ahead until you reach Turf Moor. If you are wishing to visit a public house before the game then I would point you in the direction of the Queen Victoria (Brewers Fayre Establishment) or where Lofty always recommends, the Cricket Club. At the Cricket Club you can park your car up for a mere £3-5 and enjoy the luxury of not having to walk far and enjoy your chosen refreshments. In terms of food, there are an array of chippys around the town for you to indulge in your favourite greasy meal. Unfortunately, I havent been able to get hold of any in ground food prices or what they sell so I cannot give you an insight of what you can enjoy there. The month of March was a very good one for the Clarets, winning 4 and drawing 1 of their 5 games and scoring 13 goals in the process. With this run followed a 1-1 draw against Derby, in which Derby scored a 93rd minute equalizer, and has boosted Burnley up into 6th place and hold a 4 point cushion over their closest play off contenders Preston in 7th. Robbie Blake has been chosen as the dangerman to watch out for. The veteran seems to get better with age and is pivotal in a lot of Burnley's good work. Rangers have again been inconsistant over the last month, but the last 3 games has shown encouraging signs of progress with 2 wins and a draw. The Rangers backline has remained water tight and has a record of being one of the best in the league. However the worry is the lack of firepower up front, now top scorer Dexter Blackstock has been loaned out to Notts Forest, you have to wonder where the goals will come from especially with the most threatening goalscoring midfielders out injured. With Rowan Vine still not match fit this could be a struggle for the R's, but we all know that we should expect the unexpected from an unpredictable Rangers side. 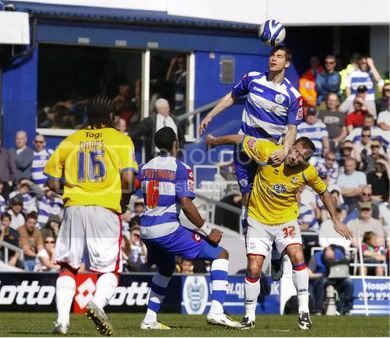 My bet of the day would be for QPR to be involved in their 10th 0-0 league draw of the season. 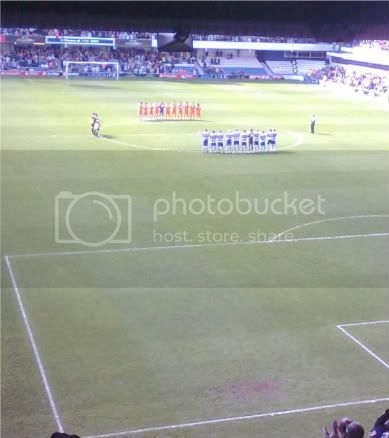 Paulo Sousa was sent to the stands as QPR and Palace played out a dire goalless draw at Loftus Road which saw the welcome return of Rowan Vine from injury. Well if anyone came to this game expecting a decent game of football, myself included I have to add, they would be surely mistaken as Palace were everything you would expect from a Neil Warnock side - not a lot of football, extremely physical, lots of stoppages and the man himself constantly whineing at everything on the touchline. So physical in fact, that it led to Paulo Sousa completely losing his cool when Samuel Di Carmine was kicked in the face, which ultimately led to him being sent to the stands by the referee. 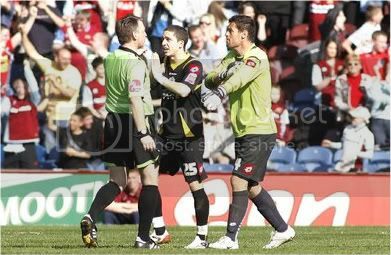 Di Carmine received some very harsh treatment from the Palace defence all afternoon. In all that though, Rangers did create some good chances with Di Carmine and Routledge both going close. But the best of all came on the hour-mark as Taarabt blazed over from 12 yards after Di Carmine's flick had put him through. QPR: Cerny, Delaney, Leigertwood, Routledge, Gorkss, Ramage, Connolly, Miller (Cook 46), Di Carmine (Balanta 85), Ephraim, Taarabt (Vine 73). Subs: Stewart, Alberti. In a disappointing afternoon, the highlight for me was on 73 minutes, which saw the long awaited return of Rowan Vine who replaced Adel Taarabt and entered the field to a fantastic reception from the R's supporters. But again, sections of the Loftus Road crowd did little else to do themselves any justice, with this time, Samuel Di Carmine being the fall guy. The chants for Rowan Vine were as early as the first half and then when anything Di Carmine did that didn't end in a goal from there after, brought booing, chants for Rowan Vine and more ridiculously, Dexter Blackstock, until he was replaced on 85 minutes, to which some, still felt the need to boo. I am personally a fan of Blackstock's but he himself has had more than his fair share of abuse from the supporters this season. But to chant for a player that has now gone out on loan to Forest, rather getting behind the team on the pitch is yet again, very disappointing. And finally, on a HAPPY note, Congratulations to friend and QPR Player Coach, Gareth Ainsworth, who's partner, Donna gave birth to Giselle Lois in the early hours of Tuesday morning! !